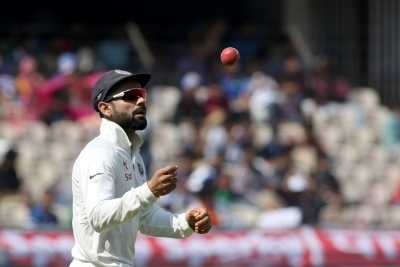 Colombo, July 22 (IANS) The two-day warm-up game between India and Sri Lanka Board President’s XI ended in a tame draw here on Saturday with most of the visiting batsmen, including skipper Virat Kohli (53) spending ample time in the middle ahead of the first cricket Test starting at Galle on Wednesday. Besides Kohli and opener Lokesh Rahul (54) getting their half centuries, the rest of the Indian batting — Ajinkya Rahane (40), Rohit Sharma (38) and Shikhar Dhawan (41) — got their respective starts before retiring out as India declared their innings at 312/9. Wicketkeeper-batsman Wriddhiman Saha was unbeaten on 36 while all-rounder Hardik Pandya could manage 11 runs before both the teams decided to wrap up the proceedings. Resuming the day at 135/3, Kohli and Rahane carried forward the Indian innings without much hiccups before Kohli walked off to allow the rest of the batters to spend some time in the middle. Earlier on Friday, Indian left-arm spin duo of Ravindra Jadeja (3/31) and Kuldeep Yadav (4/14) shared seven wickets between them to bundle out the hosts for a paltry 187. Thereafter, Rahul fired a quickfire half century while losing fellow opener Abhinav Mukund (0) and one-down Cheteshwar Pujara (12) in quick succession. Thereafter, Kohli and Rahane joined forces as India ended the first day at 135/3. Brief Scores: SLC President’s XI 187 ((Danushka Gunathilaka 74, Lahiru Thirimanne 59, Kuldeep Yadav 4/14, Ravindra Jadeja 3/31) vs India 312/9 declared: (Lokesh Rahul 54, Virat Kohli 53, Shikhar Dhawan 41, Ajinkya Rahane 40, Vishwa Fernando 2/37).